On Wednesday night at UFC Fight Night 29, Erick Silva proved once again that the face-to-fist defense is not the business. 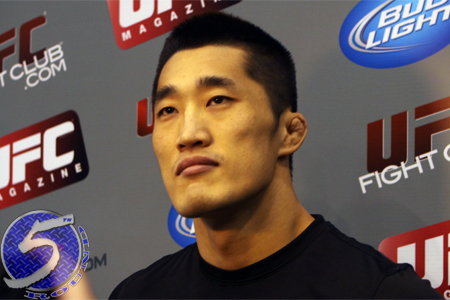 Silva blocked Dong Hyun Kim’s (pictured) left hand with his grill in the second round of their shootout and wound up unconscious on the canvas for his troubles. Kim leaving Brazil with a win wasn’t a complete shock, despite the fact he entered the Octagon as a 2-1 underdog against “Indio,” but the fashion in which he won was quite surprising. Kim’s last seven victories have come via decision and Silva had never been knocked out in 19 previous outings. The once-promising Silva has now dropped three of his past five scraps, while Kim has rattled off three consecutive W’s. UFC Fight Night 29 took place inside Jose Correa Arena in Sao Paulo, Brazil.